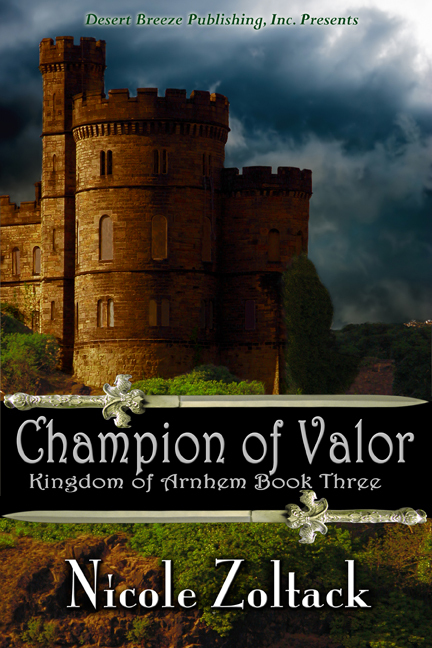 Please join me in welcoming Nicole Zoltack, author of Champion of Valor, Book III in the Kingdom of Arnhem series. Nicole, tell us a bit about your book. You have beautiful covers, by the way. Just lovely. Thank you! The genre of Champion of Valor is Fantasy Romance. The Mystical Conch Shell of the Sea has been stolen, and it’s up to Selliki, the selkie, to get it back. Selliki sets across the continent of Alethereia to find Arnhem, and Gabrael, the mage she loves. Selliki knows that no union between a selkie and a human have ever had a happy ending, but neither can ignore their feelings. Each night, they experience terrible, real dreams that show how doomed their love is. The final war between Speica and Arnhem is threatening the entire world. Lucifer has aligned himself with Speica and wants nothing less than to bring about the Apocalypse before its time. In the last battle, cowardice is revealed, promises are broken, and many people die. Trolls fight icthyocentaurs, dwarves armed up against the Drow, angels against demons. Only one kingdom will prevail; that is, if the world doesn’t end. Nicole, how can readers contact you?